ONE does not simply buy an Apple Watch. The company is positioning the smartwatch less like a gadget and more like an expensive piece of jewellery, and the buying process drums up such a sense of occasion. Buying the smartwatch requires a one-on-one session with a blue shirted ‘genius’. 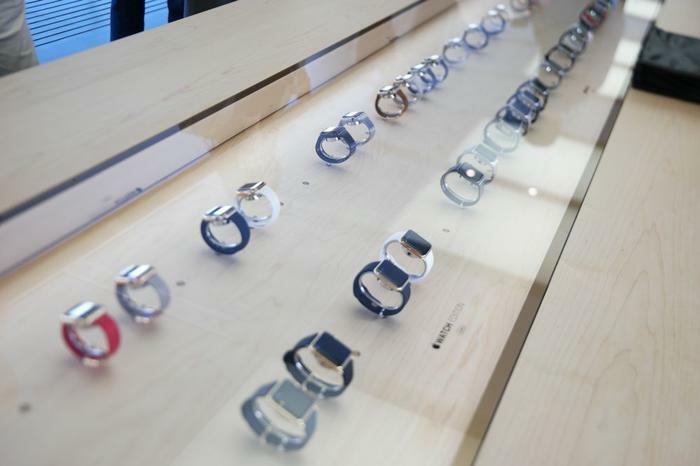 After making an appointment online, simply head into an Apple store for a fifteen minute hands on with the wearable. The process will help balance the supply with the demand ahead of its 24 April release. 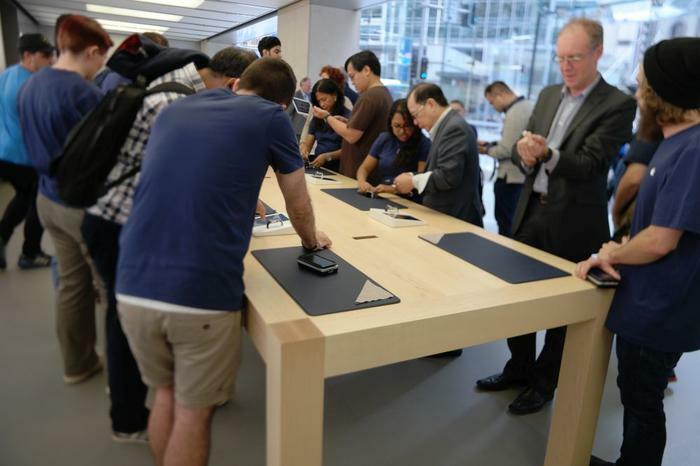 Two long tables have been set up to display the Apple Watch at the George Street store in Sydney. The first houses various combinations of the entire collection, which consists of the Watch Sport, the Watch and the Watch Edition. The smartwatch comes in sizes of 38mm and 42mm, and in six different coloured casing. Seven different styles of straps have been made and the range of colours puts the total up to 17 straps for each size of the Apple Watch. Many of the possible combinations are on display behind a pane of glass on the long stretching table. The smartwatches appear to be organised from least expensive, with the Watch Sport first on the left, towards the $14,000 Watch Edition on the far right. 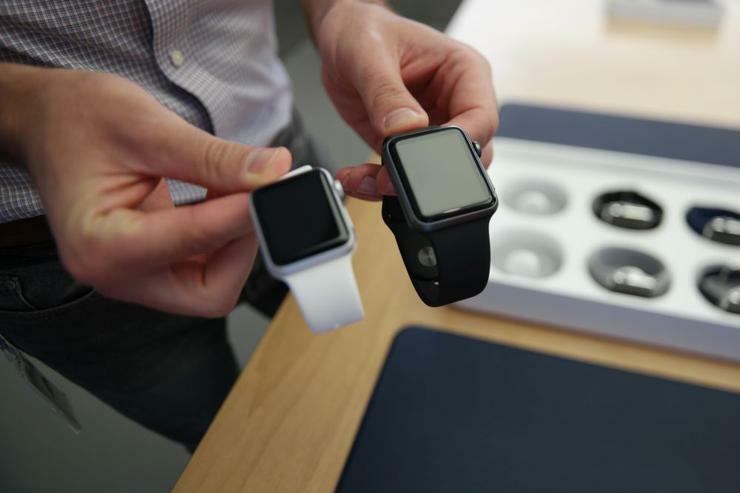 No writing taints the display other than the Apple logo and the Watch moniker. In this sense, learning about the smartwatch is a sensory experience. After having a look at the collection and the many combinations, it’s time to go to the second table for a hands on. Apple treats the fitting part like a jewellery store purchase. The demo Apple Watches rest in table drawers of the secondary table, each one rests on its side against an inductive charger in its own, neat capsule. Blue mats line the secondary table. Microfibre cloths sit uniformly folded in the corners. Trying on the smartwatch only happens over a blue mat; they are only rested on a blue mat; and if an Apple Watch slips through fingers, it will fall only on a blue mat. The prevailing takeaway is that the Apple Watch is a valuable that should be handled with great care. Our first impressions of the Watch was that photos don’t do the wearable justice. The materials behind its construction and the finish are better than expected. Having two screen sizes also works in its favour as all wrists are not equal. For instance, the 38mm Watch proved a better fit on the wrists of this dainty journalist. 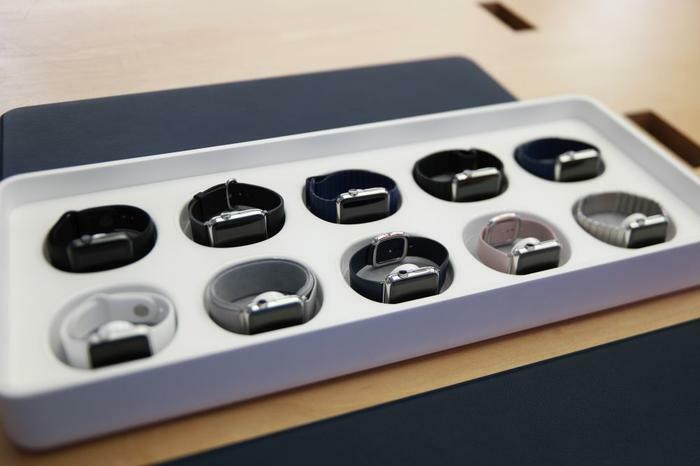 All of the Apple Watches operate on a demoed loop as to showcase the range of features in the limited 15 minute window. This means we couldn’t peruse the menu as usual. Every couple of moments a small vibration goes off. It’s the haptic engine — coined ‘taptic’ engine by Apple’s marketing whizzes. We remember the subtle vibrating queues and its effectiveness in letting us know of incoming notifications. Apple’s helpful staff guide customers through the many different bands. Standouts include the Milanese Loop, a chainmail-style band that has been magnetised. Apple had to create a new strain of stainless steel that was magnetic for this particular strap. 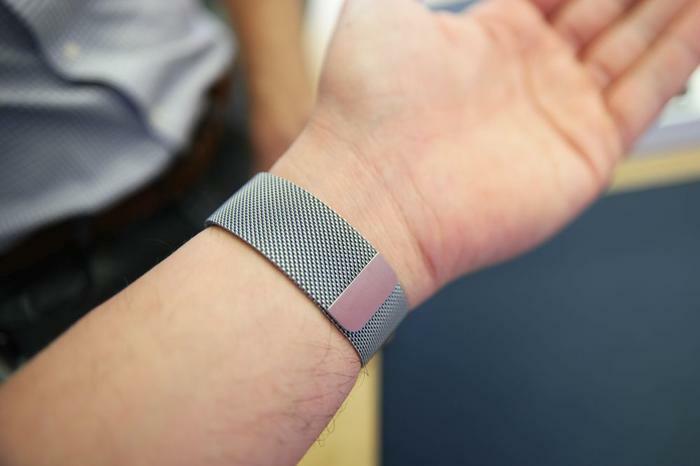 Another band houses tiny magnets within leatherette pockets. This band is simply known as the Leather Loop and its design makes it possible to adjust the watch to any number of sizes. At the upper echelon is the Link Bracelet band. This is a band typical to expensive watches, with its metal links and its butterfly closure. There’s weight to this band and, unlike traditional bands, the links can be taken off with little effort by anyone for an improved fit. 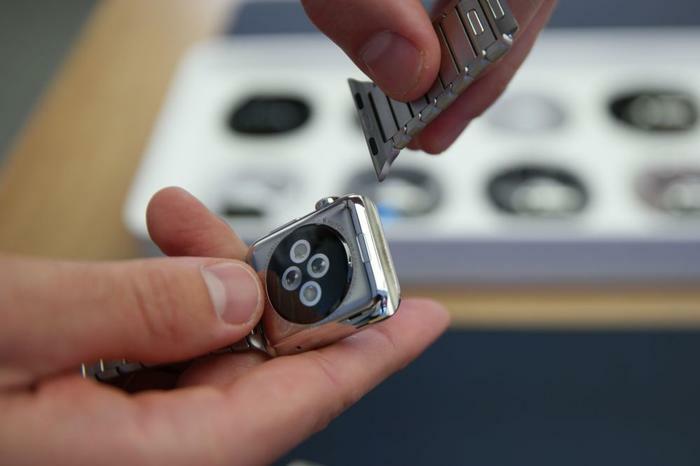 Apple has designed the smartwatch for owners to easily interchange the bands. Engage a button and the band slides right out. Exercise enthusiasts will lean towards the synthetic rubber Sports band, which houses a compartment in which the band can be tucked. It’s a clean finish that makes sure it doesn’t get caught on different things when exercising. The Watch Sport introduces the range at $499 and it is the Apple smartwatch we would most likely pick. It fits our lifestyle and, between the Space Grey coloured aluminium casing and the black Sports band, it looks stylish, is inconspicuous and is comfortable to wear. 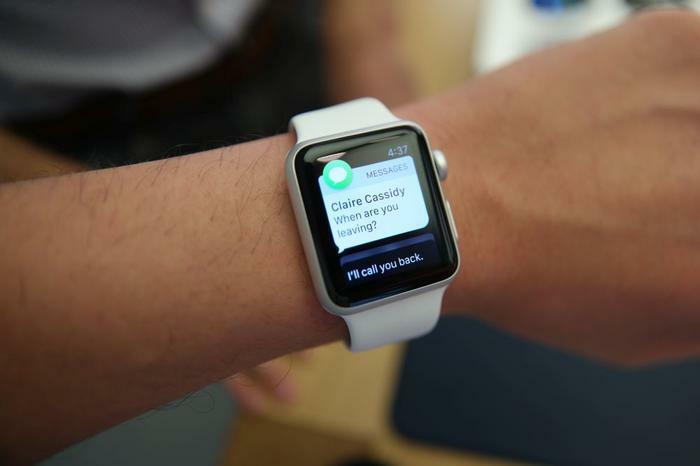 Knowing which combination of Apple Watch — or even, that we cared about another smartwatch — was something we did not know until we entered the George Street store. Fifteen minutes later we knew the version, size, colour and accompanying band going on our shopping ‘wish list’.